Goon: Last of the Enforcers is a 2017 sports comedy film directed by Jay Baruchel in his directorial debut and written by Baruchel and Jesse Chabot. A sequel to Goon (2011), the film stars Seann William Scott, Baruchel, Liev Schreiber, Alison Pill, Elisha Cuthbert, Wyatt Russell, Marc-André Grondin and Kim Coates. Principal photography began in Toronto on June 22, 2015. The film was released in Canada on March 17, 2017 and on September 1, 2017 in the United States. During a pro hockey lockout, Doug "The Thug" Glatt's (Seann William Scott) team, the Halifax Highlanders, has to contend with an influx of new players. With pro hockey suspended, media focus has descended on the lower league, and the owner of the Highlanders, Hyrum Cain (Callum Keith Rennie), seeks to capitalize on the attention. Before the opening game, Doug is made captain and leads his team out onto the ice. In a close fought game, Doug is goaded into a fight with the rival team's enforcer, Anders Cain (Wyatt Russell), an up-and-coming player with a violent streak, and the son of the Highlanders' owner. Anders wins the fight, and with Doug badly injured, the Highlanders lose the game. Dealing with rehab, Doug decides to retire and accept a more stable job as an insurance salesman. At home, Doug's wife Eva realizes that she is pregnant, and she and Doug make preparations for their new child. Without Doug, the Highlanders go on a long losing streak, prompting the owner to push for changes. He signs several overseas players and pushes to add his own son to the team. Hyrum foresees Anders as the new captain of the Highlanders, and although the coach disagrees with the move, anticipating locker room dysfunction, Hyrum strongarms him into making Anders the new captain. Meanwhile, Doug finds no joy in his new job, stuck in a dingy office, and he begins secretly training to get back into hockey. Doug visits his old rival, Ross "The Boss" Rhea, who has left hockey and now competes in a hockey fighting league, where he is the current champion. Doug convinces Ross to train him in southpaw fighting, as the injury he suffered fighting Anders has weakened his right arm. Ross agrees to train him, and Doug slowly begins to learn how to fight left-handed. Ross convinces Doug that if he joins the hockey fighting league and impresses, it could be a way to get back into minor league hockey. Doug takes Ross' advice, but the first fight ends up being a battle royale style brawl, instead of the one-on-one fights that Doug had witnessed before. Doug and Ross end up as the last two standing during the melee, but Ross is too hurt to continue and collapses before they can fight each other. In the locker room after the fight, Ross reveals that he has post-concussion syndrome, and doctors have recommended that he stop playing, as one more bad hit could cause a permanent injury. At the same time, the Highlanders have improved with Anders as the captain, but not enough to get into playoff position. Anders' self-sabotaging play, in which he constantly is being penalized for fighting, has kept the Highlanders outside of a playoff spot. In addition, Anders' aggressive and violent attitudes towards his fellow players keeps the whole team on edge, and their play suffers as a result. During another losing effort, Anders grows frustrated and ends up knocking out the entire opposing team. He is promptly suspended, and the coach demands a change. Hyrum, having seen Doug at the hockey fighting league, suggests that they add Doug back to the roster, secretly hoping that his addition will push his son to play better. Before Doug's first game back, Eva makes Doug promise that he won't fight, concerned for him now that they're about to be parents. Doug reluctantly agrees, and the Highlanders narrowly win in Doug's celebrated return. The Highlanders go on a winning streak, but when Anders returns from suspension, he goads Doug into being more aggressive. Doug and Anders interrupt a game during a dispute, and they are both suspended for the next game. During the game's afterparty, Anders provokes Doug into a fight, and when Eva sees that Doug has been fighting again, she kicks him out of the house. Meanwhile, the Highlanders must win the last two games of the season to sneak into the playoffs. With Anders and Doug suspended, Hyrum decides to sign Ross, who has still been competing in the local hockey fighting league. To free up a spot, Hyrum terminates Anders' contract, fed up with his son's antics. While Ross helps the Highlanders to win the first of their last two games, Eva goes into labor, and Doug reconciles with her as they head to the hospital. After having her baby, Eva realizes that the same drive that led Doug to be with her during the birth, is the same drive that pushes him to want to defend his teammates on the ice, and she gives Doug her blessing to continue fighting. Having been kicked off the team, Anders rejoins his old team, as they will play the Highlanders in the last game of the season with a playoff spot on the line. The game is immediately chippy, with both Ross and Anders starting fights. As the game enters the third period with the game tied, Ross and Anders are involved in a scuffle, and Anders cheap shots Ross, checking him from behind into the boards. Ross is knocked unconscious, and while paramedics take him away on a stretcher, Doug enters the rink to fight Anders in retaliation. Doug uses his southpaw training to beat Anders, but when Doug shows mercy, Anders threatens Doug, claiming that he will never stop coming for him until they are both like Ross, being carried out on stretchers. Realizing that his new family is more important to him than hockey, Doug uses his weakened right arm to level Anders, but throws his arm out and has to be helped off the ice. Hyrum rushes to his son's aid, where Anders tells him that he hates hockey, and the two appear to mend things between them. Having been told earlier that further injury to his right arm would be career-ending, Doug realizes that his hockey days are behind him. He watches as the Highlanders win the game in the final seconds, and during the celebration, he sets his stick down and goes home. Current and former hockey players Tyler Seguin, Michael Del Zotto, Brandon Prust, George Parros, Colton Orr and Georges Laraque make appearances in the film. Doug "The Hammer" Smith, whom Doug Glatt is based on, has a cameo in the "Bruised and Battered" sequence. He is head-butted by Seann William Scott in the square-off between the two Dougs. On September 24, 2012, it was announced that Jay Baruchel would be returning to write the sequel to Goon along with Jesse Chabot, while Michael Dowse was set to return to direct the film, and Evan Goldberg to produce. On May 15, 2015, it was announced that Baruchel would make his directorial debut on the film, titled Goon: Last of the Enforcers, and would also return in the role of Pat, while Seann William Scott would also return to play the role of the hockey enforcer, Doug "The Thug" Glatt. Goldberg would be executive producer, while David Gross, Jesse Shapira, Jeff Arkuss and Andre Rouleau would be producers on the film. On June 8, 2015 Elisha Cuthbert joined the cast of the film along with the returning cast of Liev Schreiber and Alison Pill from the first film. On June 10, 2015, the complete cast of the film was announced by Entertainment One, Wyatt Russell was set to play Anders Cain, a volatile young captain of the Halifax Highlanders, Marc-André Grondin to play a superstar Xavier LaFlamme, Kim Coates as Highlanders coach Ronnie Hortense, Pill would star as Glatt's love interest Eva and Schreiber as Ross "The Boss" Rhea, while Cuthbert would play Mary, the outlandish sister of Pill's character Eva, who is now married to Doug the Thug. In a tweet on July 7, 2015 from the set of the film, TSN's Sportscaster James Duthie revealed that he and T.J. Miller were cast to play the sportscasters in the film. On July 23, 2015, real NHL players Tyler Seguin and Michael Del Zotto were spotted on the set during filming along with Scott. On August 7, 2015, a tweet by Georges Laraque stated that he was headed to the set with Colton Orr and George Parros. Principal photography on the film began on June 22, 2015, in Toronto, Ontario. Baruchel also tweeted the photo of the cast from the set. Late-June, filming was taking place in Hamilton, Ontario's Corktown area, the Barrie Molson Centre in Barrie in July until August 13, 2015 and near Bayfront Park in Hamilton. On review aggregator Rotten Tomatoes, the film has an approval rating of 41%, based on 58 reviews, with an average rating of 5/10. The site's critical consensus reads, "Seann William Scott remains as watchable as ever in the title role, but Goon: Last of the Enforcers repeats its predecessor's violent and profane formula to diminishing effect." On Metacritic, which assigns a normalized rating to reviews, the film has a weighted average score of 48 out of 100, based on reviews from 17 critics, indicating "mixed or average reviews". Barry Hertz from The Globe and Mail gave the film 3 out of 4 and wrote "Baruchel's sequel is everything Dowse's original film was, amped up a degree or three: The fights involving dim-bulb hero Doug (Seann William Scott) and his various rivals are bloodier, the locker-room talk is dirtier and the on-ice action is slicker. The unlikely project – how many made-in-Canada films spark a franchise? – doesn't quite reach the heights of the original film, which found surprising pathos in Doug's tale of sweet good guy to brutal goon. But it delivers on nearly every other scale, including standout performances from returning players Scott, Alison Pill and Liev Schreiber, as well as some bits of comic gold courtesy of series rookies Wyatt Russell, T.J. Miller and Jason Jones." Toronto Sun gave the film 3.5 out of 5, and stated "Violent, crude and really funny, Goon: Last of The Enforcers, works for the same reason the original Goon worked — you will love the characters." National Post gave the film a 1 out of 4. ^ a b c d "Goon: Last of the Enforcers (2017)". AllMovie. Retrieved April 22, 2017. ^ "Hot Sheet: Top 5 Canadian films April 21 to 27, 2017". Playback. Brunico Communications. May 2, 2017. Retrieved May 9, 2017. ^ "Goon: Last of the Enforcers". ComingSoon.net. Crave Online. Retrieved 25 February 2018. ^ a b c d e f g h i j k Fleming Jr, Mike (June 10, 2015). "Hockey Brawler Pic 'Goon' Sequel Has Wyatt Russell Squaring Off With Liev Schreiber, Seann William Scott". deadline.com. Retrieved June 12, 2015. ^ a b c "James Duthie stars alongside T.J. Miller in the Goon sequel!". tsn.ca. July 8, 2015. Retrieved July 23, 2015. ^ a b Peters, Chris (July 23, 2015). "LOOK: Tyler Seguin, Michael Del Zotto on set for 'Goon 2' cameos". cbssports.com. Retrieved July 24, 2015. ^ TRUMBORE, DAVE (September 24, 2012). "Jay Baruchel Tweets GOON 2 Update; Will Co-Write with Jesse Chabot and Michael Dowse Will Return to Direct; Evan Goldberg Will Produce". collider.com. Retrieved June 12, 2015. ^ a b Kit, Borys (May 15, 2015). "Jay Baruchel to Direct 'Goon' Sequel (Exclusive)". hollywoodreporter.com. Retrieved June 12, 2015. ^ Kit, Borys (June 8, 2015). "Elisha Cuthbert Joins Seann William Scott for 'Goon' Sequel (Exclusive)". hollywoodreporter.com. Retrieved June 12, 2015. ^ Georges Laraque [@GeorgesLaraque] (Aug 7, 2015). "With Colton Orr and @GeorgeParros on our way to the set to film "Goon 2" yeah!" (Tweet). Retrieved May 11, 2017 – via Twitter. ^ "On the Set for 6/22/15: Spielberg's 'The Bfg' Wraps Along with 'Teenage Mutant Ninja Turtles' Sequel, Woody Harrelson Starts 'Wilson'". ssninsider.com. June 22, 2015. Archived from the original on June 27, 2015. Retrieved June 23, 2015. ^ Jay Baruchel [@BaruchelNDG] (June 19, 2015). "The boys are back in town. #GOON #LASTOFTHEENFORCERS" (Tweet). Retrieved May 11, 2017 – via Twitter. ^ "Browse by Corktown in Area at Historical Hamilton". historicalhamilton.com. Retrieved 2015-08-29. ^ "Extras wanted for 'Goons 2' filming in Barrie". barrie.ctvnews.ca. July 8, 2015. Retrieved July 8, 2015. ^ "Filming in Hamilton this week". thespec.com. June 30, 2015. Retrieved July 1, 2015. ^ "Goon: Last of the Enforcers (2017)". Rotten Tomatoes. Retrieved September 1, 2017. 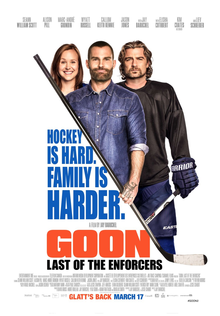 ^ "Goon: Last of the Enforcers reviews". Metacritic. CBS Interactive. Retrieved September 1, 2017. ^ Hertz, Barry (March 17, 2017). "Goon: Last of the Enforcers is a welcome addition to a Canadian hockey franchise". The Globe and Mail. Retrieved August 12, 2017. ^ Braun, Liz (March 16, 2017). "'Goon: Last of the Enforcers' review: Violent, crude and funny". Toronto Sun. Retrieved August 12, 2017. ^ Marsh, Calum (March 19, 2017). "Gross misconduct: The unfunny Goon sequel is everything its predecessor managed not to be". National Post. Retrieved May 11, 2017.